A home’s entryway is a portal to the architectural beauty that lies within, and being the first thing that your guests will see, you want it to make a statement. Today we will discuss the variety of layouts and styles a timber frame home’s entryway can display to really make a good first impression. 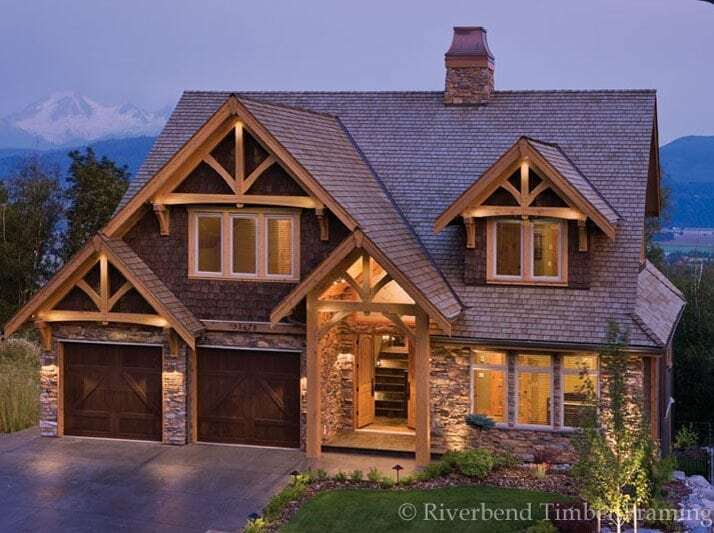 Many future homeowners who desire to build a timber frame home tend to focus the most on the great room space, after all it is the location where most of the home’s timber framing is displayed and it is also the central and primary area where the most time will be spent. Couples often don’t think about the opportunity available for other areas of the home as well, like the entry. Many of our past clients have demonstrated that by incorporating front patios and above the entrance balconies to their home, they not only increase their outdoor space for things like a quiet cup of coffee in the morning, but they also create a more inviting feel for visitors or neighbors stopping by for a quick chat. 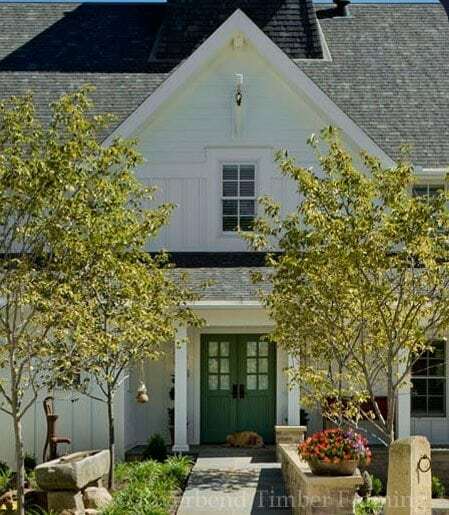 Another popular option many people choose is to have their entry blend with a front or wraparound porch system, creating a relaxed, country appeal that flows to all of the home’s outdoor spaces. 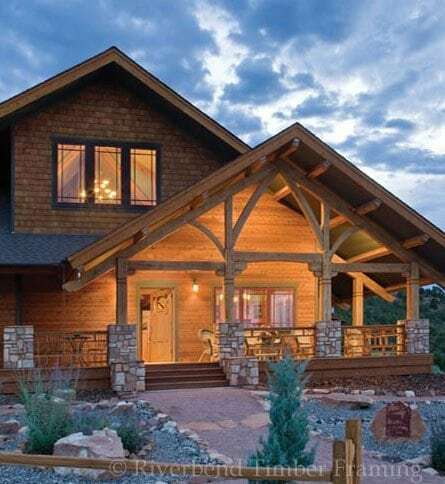 A home’s timber frame structure does not have to be limited to its interiors. Consider whether or not you would like to have some of your timber framing’s artisan design repeated in your entryway. Having a truss over an entry door or even a bent system that creates an extended cover for the front step is common in many traditional timber frame homes. Your design could include a small, simple truss above the entry that matches the trusses found in all of your roof pitches, or perhaps you’d like to have a larger truss that spans the length of the front porch. 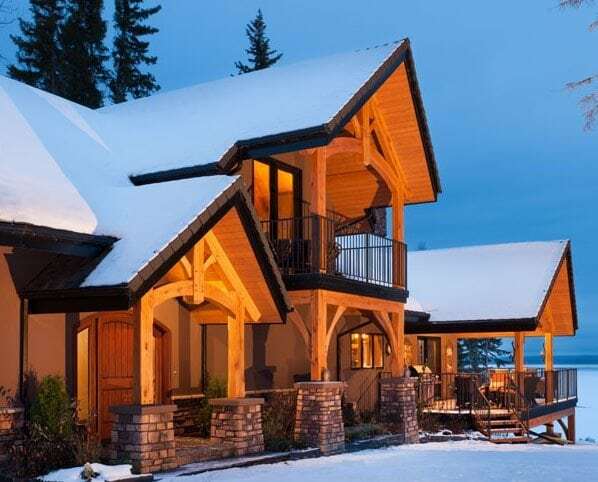 Speak with your project’s designer to brainstorm how your home’s timber framing can be highlighted in this area of the home. Whether you choose aluminum, wood, or fiberglass, your front door’s design does not end with its material. There are many factors of a door’s selection that can set the tone for your home’s overall look and feel for a guest. For instance, have you considered having double doors for a grander, wider entrance? Or maybe you want a more detailed entry to match your home’s overall architectural style. Many clients will even select brightly colored doors to create a contemporary, bold contrast that really stands out. No matter how you and your designer choose to design your home’s entryway, make it a reflection of your personal style and lifestyle, after all, it is the first thing that your guests will see!